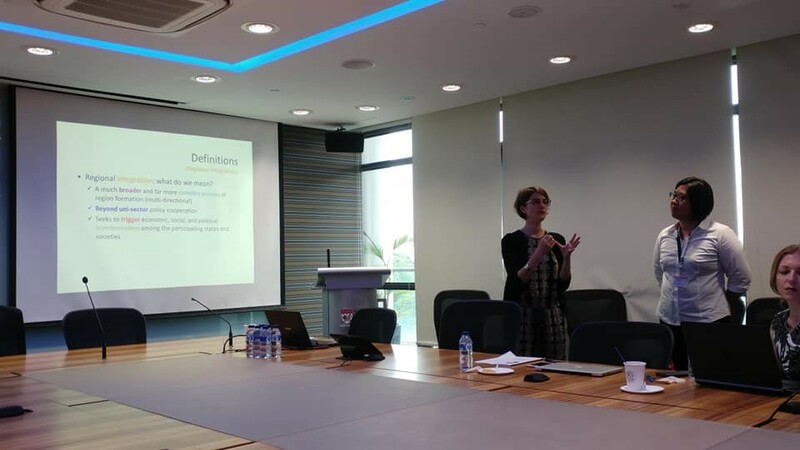 On 9 and 10 July 2018, Meng-Hsuan Chou (NTU Singapore) hosted three seminars on higher education issues at Nanyang Technological University, Singapore. Speaking on ‘What does comparative regionalism offer to higher education research?’, Pauline Ravinet (University of Lille) and Meng-Hsuan Chou introduced the concept of ‘higher education regionalism’, a heuristic framework to examine regional cooperation in the higher education policy domain, and empirically compared and analysed two instances of higher education regionalisms (Europe and Southeast Asia). 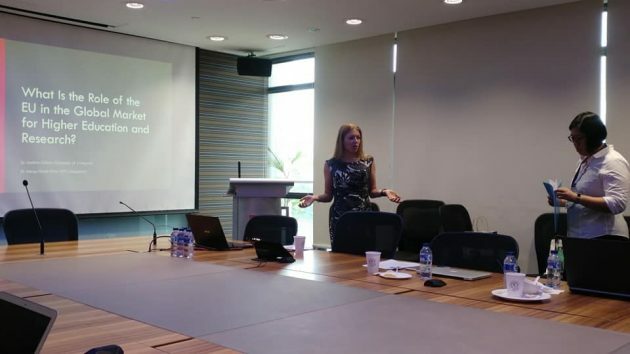 In so doing, this talk engaged with and challenged the diffusion argument common in both European higher education studies and new comparative regionalism. The empirical case comparisons used publicly accessible documents from regional bodies active in higher education policy coordination, and more than 50 semi-structured interviews with key policy actors involved in these developments. Specifically, the empirical application identified and traced the policy ideas of European and Southeast Asia higher education regionalisms, and considered whether the extant models of regional cooperation and knowledge discourse affected their evolution. Their findings revealed that the so-called ‘Bologna Process export thesis’ and the diffusion assumptions of comparative regionalism were too simplistic and somewhat misleading. Indeed, they concluded that an interdependent perspective offered more traction to understanding the emergence and evolution of higher education intra- and inter-regionalisms. In ‘What is the role of the EU in the global market for higher education and research?’, Andrea Gideon (University of Liverpool) and Meng-Hsuan Chou discussed the influences that the European Union (EU) exerts globally in the areas of research and higher education from political science and legal perspectives. At first glance, it is not obvious that a regional organisation would have any role beyond coordinative support in sensitive policy domains such as higher education and scientific research. However, they described how the EU has been playing a role since the very early years of integration; this role has been expanding since the 1990s with new initiatives being increasingly developed and centralised at the supranational level. They then discussed the emergence of a potential EU model with regards to higher education and research, and considered whether and how this model could be promoted and defended within and beyond the European territorial borders. Presenting on ‘What determines membership in meta-organisations? The case of higher education and the international association of universities’, Jens Jungblut (Stanford University / University of Oslo) identified what determined membership in the International Association of Universities (IAU) – the only global meta-organisation in higher education. Barriers to IAU membership are low and yet, at the same time, not all universities are members. Using multi-level regression analysis on data from the World Higher Education Database, he tested multiple predictors. The findings suggested that younger private institutions from peripheral areas and those with high status ranks were more likely to be IAU members. International offices, membership in regional university associations and international curricula were also strong predictors, which suggest that members are of a particular type—the internationally-oriented university. 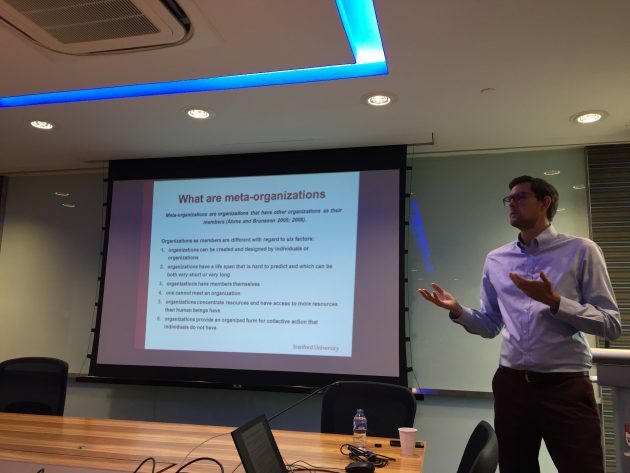 He concluded that meta-organisational membership is a complex process involving multiple factors, while being conditioned by the degree of fragmentation and stratification in an organisational field. This entry was posted in Education, Global & International, Politics & Public Policy, Publications & Events, Science & Technology, The EU and tagged Bologna process, higher education, regional integration, research collaboration, research policy, universities. Bookmark the permalink.